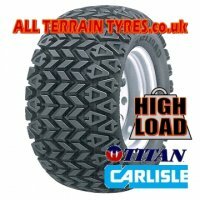 The Carlisle TRAIL WOLF is an original fitment tyre on Bombardier and Yamaha ATV's. Made using a tough puncture resistant casing, an extra-thick sidewall and a harder rubber compound. This means better wear and longer intervals between replacement of your quad tyres.